England is a land of extraordinary variety, rich in buildings, landscapes, peoples and wildlife. But this diversity is under siege. Mass production, fashion, increased mobility and the forceful promotion of corporate identity have brought with them standardised shop fronts, farm buildings, factories, forests and front doors, while intensive farming has created a bland, empty countryside. 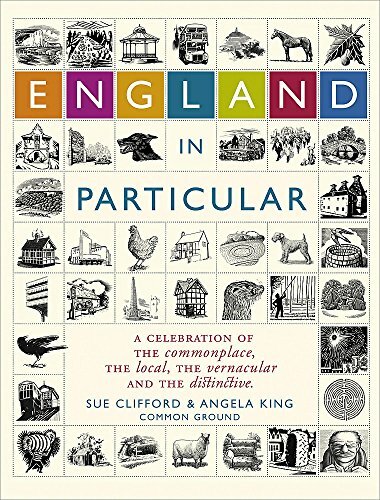 ENGLAND IN PARTICULAR is a counterblast against loss and uniformity, and a celebration of just some of the distinctive details that cumulatively make England. It is the culmination of more than twenty years' work by Sue Clifford and Angela King, who founded Common Ground with Roger Deakin. ENGLAND IN PARTICULAR is a ground-breaking work, destined to become a classic. Two pocket-sized hardback editions of extracted essays from ENGLAND IN PARTICULAR are also available: JOURNEYS THROUGH ENGLAND IN PARTICULAR: COASTING and JOURNEYS THROUGH ENGLAND IN PARTICULAR: ON FOOT. Common Ground is a charity that has pioneered the notion of 'local distinctiveness': written by two of the founders, this book is a celebration of that principle. It presents an A-Z of the landscapes, buildings, people and wildlife and the 'conspiracy of nature and culture' that make each place unique. From Abbeys to Zig Zags, via Hare Pie Scrambling, Synagogues and Well-Dressing, in entries often accompanied by woodcut illustrations, the book explores 'the extraordinary richness of our everyday surroundings'.